A river is a natural stream of freshwater that is larger than a brook or creek. Rivers are normally the main channels or largest tributaries of drainage systems. Typical rivers begin with a flow from headwater areas made up of small tributaries, such as springs. They then travel in meandering paths at various speeds. Finally, they discharge or flow out into desert basins, into major lakes, or most likely, into oceans. Sixteen of Earth's largest rivers account for close to one-half of the planet's river flow. The world's longest river is the Nile River in Africa, which runs 4,187 miles (6,739 kilometers) from its source in Burundi to the Mediterranean Sea. However, the world's largest river is the Amazon River in South America. It runs about 3,900 miles (6,275 kilometers) from its source in the Andes Mountains in Peru to the southern Atlantic Ocean. Discharging an average of 7,000,000 cubic feet (198,000 cubic meters) of water each second, the Amazon River alone accounts for 20 percent of the water discharged each year by Earth's rivers. Brook: A significant, continuously flowing body of water formed by the convergence of a number of rills. Catchment area: Also known as a drainage basin, the entire land area drained by a river. 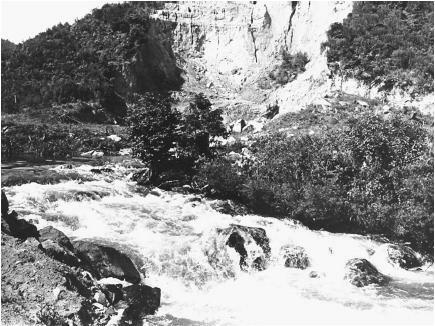 Episodic rivers: Rarely occurring rivers formed from runoff channels in very dry regions. Perennial rivers: Rivers that have a constant stream-flow throughout the year, usually located in more humid climates where rainfall exceeds evaporation rates. Periodic rivers: Rivers that run dry on occasion, usually located in arid climates where evaporation is greater than precipitation. Rill: A small brook that forms from surface runoff. Runnels: Eroded shallow channels created when rills pass over fine soil. Tributary: A stream or other body of water that flows into a larger one. Watershed: A ridge of high land that separates the catchment area of one river system from that of another; also used synonymously with catchment area. Every river has a point of origin. Because gravity plays a key role in the direction that rivers take, rivers almost always follow a downhill slope. Thus, the point of origin for rivers tends to be the highest point in the watercourse. Some rivers start from springs, especially in humid climates. Springs occur as groundwater rises to Earth's surface and flows away. Other rivers originate from lakes, marshes, or runoff from melting glaciers located high in the mountains. Often, rivers having their beginnings in huge glaciers are quite large by the time they emerge from openings in the ice. Precipitation, such as rainwater or snow, on highlands is the source of the water for most rivers. When a heavy rain falls on ground that is steeply sloped or is already saturated with water, water runoff trickles down Earth's surface rather than being absorbed. Initially, the water runs in an evenly distributed, paper-thin sheet, called surface runoff. After it travels a short distance, the water begins to run in small parallel rivulets called rills. At the same time, the water becomes turbulent. As these rills pass over fine soil or silt, they begin to dig shallow channels, called runnels. This is the first stage of erosion. These parallel rills do not last very long, perhaps only a few yards. Fairly soon, the rills unite with one another until enough of them merge to form a stream. After a number of rills converge, the resulting stream is a significant, continuously flowing body of water, called a brook. As a brook flows along and groundwater supplies add to the amount of water the brook carries, it soon becomes a river. Rivers can have different origins and, as they travel, often merge with other bodies of water. Thus, the complete river system consists of not only the river itself but also all of its converging tributaries. As rivers make the trip from their source to their eventual destination, the larger ones tend to meet and merge with other rivers. Resembling the trunk and branches of a tree, the water flowing in the main stream often meets the water from its tributaries at sharp angles, combining to form the river system. As long as there are no major areas of seepage and the evaporation level remains normal, the volume of water carried by a river increases from its source to its mouth with every tributary. Along its path, a single river obtains water from surface runoff from different sections of land. The area from which a particular river obtains its water is defined as its catchment area (sometimes called a drainage basin). The high ground or divide separating different catchment areas is called a watershed. At every point along the line of a watershed, there is a downward slope going into the middle of the catchment area (watershed is also often used as a synonym for catchment area). Climate conditions and rainfall patterns have a great effect on rivers, dividing them into three general types. The first are the perennial or permanent rivers. Normally, these rivers are located in more humid climates where rainfall exceeds evaporation rates. Although these rivers may experience seasonal fluctuations in their water levels, they have constant stream-flow throughout the year. With few exceptions, stream-flow in these rivers increases downstream, and these rivers empty into larger bodies of water such as oceans. In fact, 68 percent of rivers drain into oceans. All of the world's major rivers are perennial rivers. The second type are the periodic rivers. These rivers are characterized by an intermittent (not continuous) stream-flow. Usually appearing in arid climates where evaporation is greater than precipitation, these rivers are dry on occasion. Typically, these rivers have a decrease in stream-flow as they travel. Often, they do not reach the sea, but instead run into an inland drainage basin. The third type are the episodic rivers. These rivers are actually the runoff channels of very dry regions. Where there is only a slight amount of rainfall, it often evaporates quickly. Thus, this type of stream-flow occurs rarely. For centuries, rivers have been very important to human society. Rivers have provided vital transportation links between oceans and inland areas, and have also provided water for drinking, washing, and irrigation. 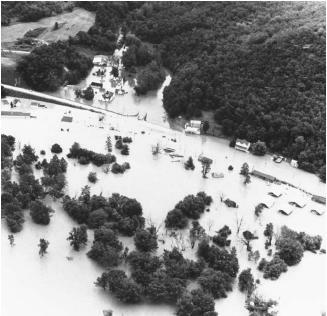 The need to prevent natural flooding and the desire to utilize the rich soil of flood plains for farming have made river management a key part of civil engineering. of the expense and the size of the projects. In fact, none of the major rivers in the world is controlled or even managed in a way that modern engineering and biological techniques would allow. So far, only medium-sized streams have been successfully managed. Well I have a question ,I was wondering if you could help me answer it? How do humans influences the Amazon River? I am doing a reasearch paper in my sience class. On the different types of Biomes. My partner and I have choosen to do fresh water. We decided to base it on the Amazon River.That is one of the questions we must answer in the paper.But I haven't been able to find a web site with a good enough answer. So thank you for your time. I am doing a reasearch paper in my science class. How can I also get permission to reproduce the photo of the Wilkes Barre flood that you have posted on this site? Thank you! The other day I was thinking about the origin of subterranean rivers come from. We have a well instead of receiving city water, and during droughts it dries up, which had me thinking, "Where does well water come from?" Then I desired to know where all subterranean sources of water originates from. Could you help me out? Thank you for your time. i would like to become a scientist. thank you for reading this. is it possible that the water will vanish? what are the reasons behind? Can you provide types of river formation?